Uses Polymer version "^1.0.0-rc.16" MYSQL via sqljocky "^0.14.1"
PGSQL via postgresql version "^0.3.3"
USE THIS INSTALL GUIDE AND IGNORE THE INSTALL PAGE!!! This is a stand alone app! 3 . now click on "migrate to newer version". dartabase_migration should have executed the actions specified inside the "UP" key for all files INCLUDING the goal migration version. 3 . now click on "migrate to older version". dartabase_migration should have executed the actions specified inside the "DOWN" key for all files EXCLUDING the goal migration version. open the "create Scaffold" view in your project. start "dart_demo\db\server\simple_server.dart" followd by "dart_demo\web\db\index.html"
another example with data could look like this 3b. 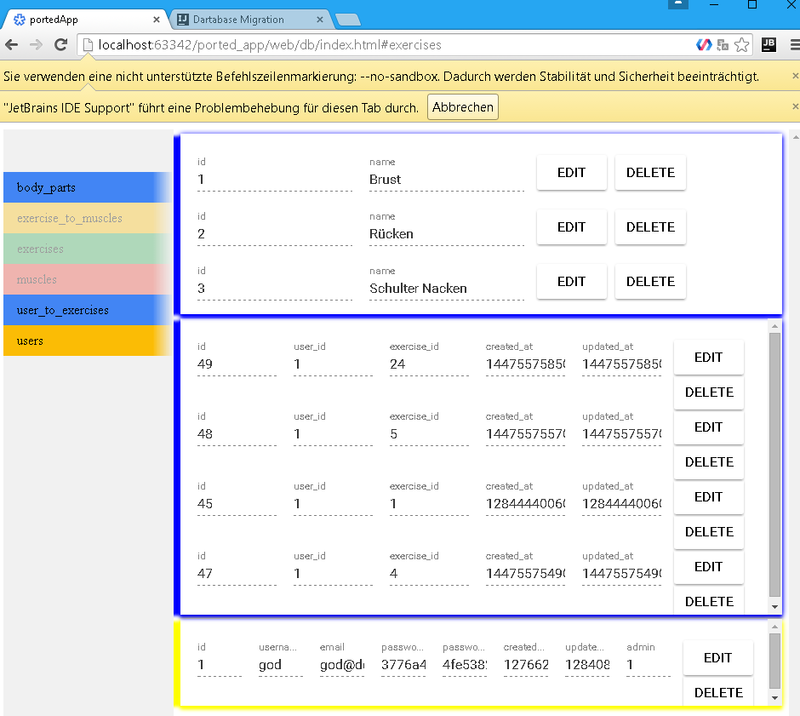 The 'id' column will be generated by 'Dartabase Migration' for every table as primary key. Dont add 'id' in any of the migration files. For each table a created_at and updated_at column will be generated automatically. dartabase_migration types are Specified in capitals. on creation or when switching DBAdapter from PG to MY. Please let me know about bugs you find and or improvements/features you would like to see in future. -fixed problem due to generation of table column created_at using now(). 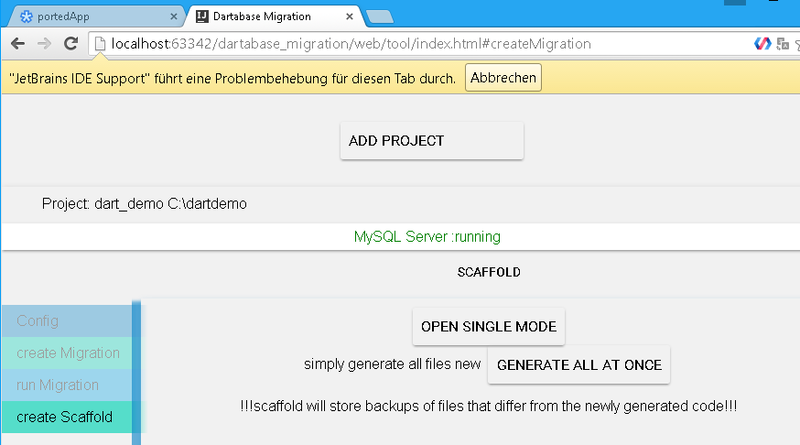 //pls file me a bug, if you still have problems creating tables via migration. 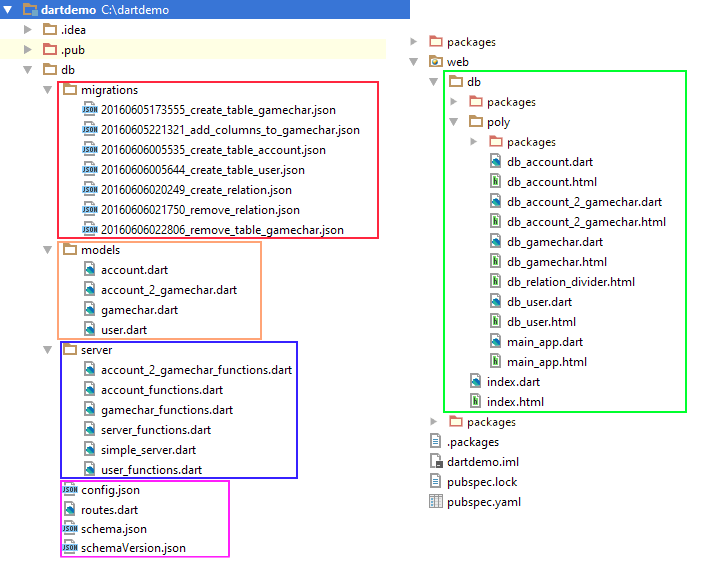 Database Migration is a version-controlled database structure manipulation for MySQL(sqljocky) and PGSQL(postgresql) without having to write SQL. now supports scaffolding(database2code) ORM CRUD inspired by Ruby on Rails! !